While computer games, the Wii, iPads and DVDs are a good standby on a rainy day, sometimes they are more trouble than they are worth, especially when they cause sibling squabbles and petty arguments. So what can you do this winter to keep your kids engaged and entertained when they can’t go outside? Here are three great educational game and toy tips to help you survive the winter blues. Teachers and children’s health professionals recommend that children need to learn to play happily on their own. If your kids need you to play with them, or to be their referee when arguments start, they will miss out on the opportunity to develop self-reliance. Puzzles are a great way to develop independent play. Whether it comes with 5 pieces or 500 pieces, a puzzle can also while away a few hours no matter what the weather. When choosing a puzzle, make sure you select one that is appropriate for your child’s age and level of skill. Are based on an educational theme or current favourite character. Have obvious border pieces that can be connected first. Your older children might enjoy a more challenging puzzle that will take several days to complete – but don’t forget to set this expectation up at the start so that your child knows that the puzzle will take time to complete. Also, make sure the unfinished puzzle is stored in a safe place where younger siblings can’t spoil your older child’s efforts! Cooperative play is a skill that kids need to learn. It requires communication, collaboration and compromise – things that some adults even find difficult! 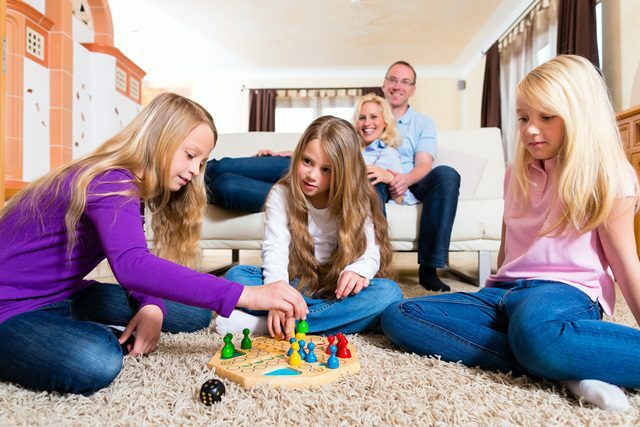 Board games are a great way to develop your children’s cooperative play skills. An added benefit is that they can also develop their thinking and learning competencies. There are hundreds of board games on the market and many have ‘junior’ versions suitable for children under the age of 10. Just make sure that you choose board games that are appropriate for your child’s age and interest. Card games are another great standby for wet weather. They also have the advantage of being super portable and so come in very handy in airports, waiting rooms or the homes of friends and relatives who don’t have children and have no toys around to keep kids amused. Other card games that are associated with superheroes like Pokeman, Yu-Gi-Oh and Bakugans are also engaging for imaginative boys, while old favourites like Uno can be played by the whole family. Wet winter days are a perfect time to develop your child’s imaginative and creative skills. Boys and girls love to have extended opportunities to build a world of their own and there are many ways that you can facilitate this. Dress ups provide children of all ages with creative fun. You can purchase costumes representing fairies, princesses, superheroes and cowboys, or just have a box of shirts, ties, hats and jewellery that kids can experiment with. Add a mirror and your child’s role playing will hit new heights. Construction toys like Lego, Meccano and Connex also help kids to become resourceful and inventive. In addition, these toys develop children’s fine motor skills, making them a great choice for kids of all ages. Art and craft activities are another winner for a wet winter day. A simple easel combined with paints, textas, crayons and coloured pencils can provide children with hours of fun. Play Doh is another tried and true favourite, as are sticker and colouring books. For older children, craft packs that contain everything a child needs to make jewellery, scrapbooks or models are also a good way to spend a rainy day, while the ever popular Beados have a novelty factor that appeals to kids of all ages. So this winter – give your children an alternative to the TV and save your sanity. With a bit of planning and some well-chosen toys and games, you and your children can survive the wet winter weather! What educational games and toys do your children enjoy? Share your top tips in the comments box below.